Jennifer Samuels, a teacher and a Democratic candidate for the Arizona House of Representatives in LD15, speaks to other teacher candidates and constituents at a campaign event, in Scottsdale, Ariz. Samuels was part of the Red For Ed movement by Arizona teachers successfully striking for higher pay and funding for schools. The spring of teacher uprisings has given way to summer, but these are anything but lazy days for educators continuing the fight through their own election campaigns. 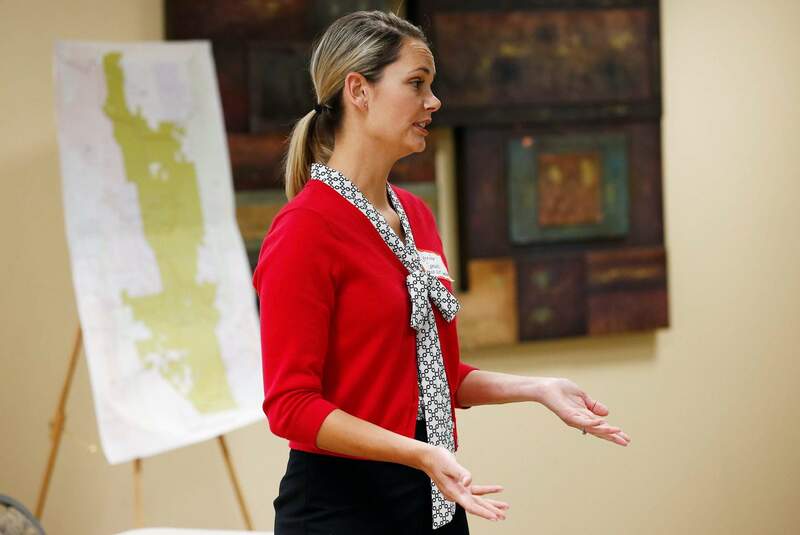 In Oklahoma, where more than half the 100 educators who filed for office survived last month’s primary elections, teachers describe a contentious relationship with state Republican leaders over stagnant funding for schools and the rejection of a teacher pay hike. “At their heart, they didn’t respect the public schools and public school teachers,” said John Waldron, a Tulsa high school government and history teacher who is running for the Oklahoma House. ArizonaA six-day teacher walkout this spring kept most Arizona students out of school while teachers protested for increased pay and school funding. Lawmakers passed a budget that authorized a 20 percent teacher pay increase over three years but fell short of demands for more overall funding for public schools. Sitting in the front row of the Senate gallery that May night was Jennifer Samuels, a Scottsdale teacher who been leaning toward a run for office – but not until 2020. Jennifer Samuels, center, a teacher and a Democratic candidate for the Arizona state House of Representatives in LD15, talks with fellow teachers and political candidates Christine Marsh, right, a Democratic Arizona state Senate candidate for LD28, and Eric Kurland, left, a Democratic candidate running for the Arizona state House of Representatives for LD23, at a campaign event in Scottsdale. Ariz. Samuels and the other teachers were part of the Red For Ed movement by Arizona teachers successfully striking for higher pay and funding for schools. She is now a candidate for the state House – one of more than 40 Democrats running for state legislature who are current or former teachers or education professionals, according to the Arizona Democratic Legislative Campaign Committee. The state Republican Party says at least four current educators are running for the legislature. The mother of three acknowledges she’s an underdog, but she feels propelled by the grassroots movement that inspired her to run. OklahomaWaldron, the Tulsa teacher, was among dozens of Oklahoma teachers who unsuccessfully ran for office in 2016. This year, their numbers have multiplied, partly because the candidate filing period coincided with a two-week April walkout when tens of thousands of educators closed school districts and thronged the Capitol demanding more funding for public schools. Carri Hicks, a Democrat who’s a fourth-grade math and science teacher from Deer Creek, said she is running for state Senate because teachers need a voice inside government. “We need protected class sizes. We need a respectable salary. And I think those echoes you’ve heard of teachers feeling undervalued or disrespected are really tied to that,” Hicks said. KentuckyMany teachers in Kentucky were getting more involved in politics to oppose a 2017 law that made charter schools legal when the Republican-controlled state legislature proposed changes to the state’s underfunded pension system. That prompted thousands of teachers to march on the Capitol in a protest that forced dozens of school districts to close. At least 34 current or former teachers are seeking seats in the state legislature this fall. About two-thirds are Democrats. It’s the most educators on the ballot ever in Kentucky, according to David Allen, a former president of the Kentucky Education Association.